Splurge Or Save… On A Striped Maxi Skirt! Most of my spring go-to looks consist of black & white outfits, but as I’m trying to find a balance between lightweight & frilly separates, while warding off the chill from cooler nights, I’ve been thinking a lot about maxi skirts. They’ve been all over storefront windows lately & I’m loving the idea of a modern skirt that can be dressed up for a date or made casual chic with gladiator flats. Even though I’m usually a fan of black & white in polka dots, houndstooth, or zebra print, I’m getting on board the stripe trend for spring, especially since there are so many different versions of this skirt to pick from. This includes the plus size a.n.a. striped maxi skirt ($19.99) from JC Penney & Dress Barn‘s Roz & Ali two-toned striped maxi skirt ($30.00), which will pair nicely with solid tops in red, pink, or mint. 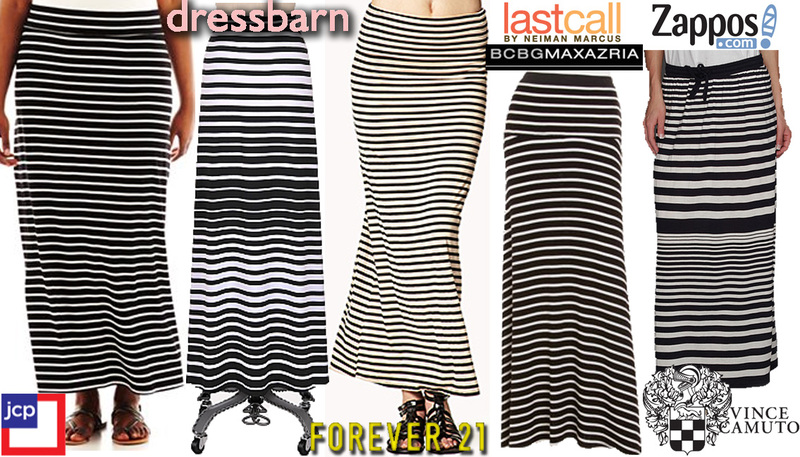 You can find the third option @Forever 21, which is the striped jersey maxi skirt ($15.80), available in sizes XS – L.
My fourth selection is the BCBG striped knit maxi skirt ($48.30) from Last Call by Neiman Marcus, which has been marked down from its original $98.00 price tag. Lastly, the TWO by Vince Camuto nautical stripe maxi skirt ($79.00) from Zappos offers a summer-ready look for boat shoes & a crochet tank. Which striped skirt do you like the best? How much would you spend on a maxi skirt this season? For more posts from Splurge or Save? check out black peplum tanks inspired by Naya Rivera & Amy Adams, leather moto jackets from True Religion & Jil Sander, Kim Kardashian’s silver Jimmy Choo pumps, & pink skinny jeans by Michael Kors & Ann Taylor! Happy Styling! This entry was posted in Basics for a Bargain, Quickie Darling Deal & Steal, Splurge or Save?, Style Darling Daily and tagged a.n.a, affordable fashion, BCBG, black & white, Dress Barn, Forever 21, JC Penney, Last Call by Neiman Marcus, maxi skirt, nautical stripe, roz & ALI, Splurge or Save?, striped maxi skirt, Vince Camuto, Zappos. Bookmark the permalink. ← Haute Headlines: My Review Of ‘The Great Gatsby,’ Selena Gomez’s InStyle Cover, Jennifer Lopez Returns To Kohl’s For Fall, & More!